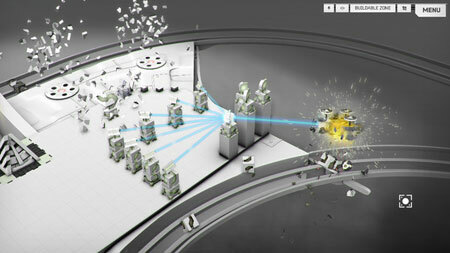 The White Laboratory is a sandbox style physics-based tower defense and RTS game developed by Laboratory Systems. You modularly build and command robotic structures. Use them to defend against or conquer other disobedient mechanical blocks on a facility floating in the atmosphere of a remote gas planet. In the series of missions, combine robotic modular geometry components into different structures to adapt to combat situations. Build ground defenses around, send propeller air probes, attract and transfer scrap resources, and anything else the physics allows. Clean up anything unwanted to complete the maintenance task. 99% of the stuff is physically simulated, affecting how objects move and behave in action. Consider physical phenomenon when making strategic decisions. If you get stuck in the game, check out the video walkthrough and gameplay for the game. This entry was posted in PC Games, Walkthrough and tagged The White Laboratory Cheats, The White Laboratory Gameplay, The White Laboratory Guide, The White Laboratory Strategy, The White Laboratory Walkthrough by Marvin. Bookmark the permalink.